Nascar got what it wanted. Big names. A big wreck. Big drama at the finish. 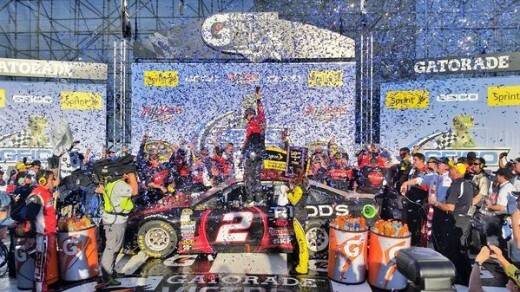 The path Nascar took to get to this point was a little off kilter; so, here is a breakdown of winners and losers from Talladega in this Nascar recap of the Geico 500. Win: Brad Keselowski Let’s assume you hate Keselowski. You now have someone to actively root against for the next three weeks. Not since Kyle Busch five years ago has someone been polarizing and successful enough to do someone with that venom. Let’s assume you like Keselowski. In one of the biggest races of his career, the Blue Deuce won with a torn up car. Should Keselowksi every get to the Hall of Fame, those final laps get shown during the induction video. Let’s assume you have no opinion on Keselowski, you’re one of eight Nascar fans on the planet who feels this way. Nascar needs a lightening rod and has one who just made the Sprint Cup Elite Eight. What a great year that went down the toilet Sunday. For a team that so far won nearly 40 percent of the 2014 Sprint Cup races to only have one driver left in the field has to be a letdown for Rick Hendrick. Granted, Kasey Kahne never really had it together in 2014. Dale Earnhardt Jr. did slow at the end, though he could have easily won Sunday. Jimmie Johnson was good, but not typically No. 48 dominant. Still, for all three to bow out at the half-way mark is a surprise most Sprint Cup fans didn’t see coming. On one hand, Nascar got what it wanted. 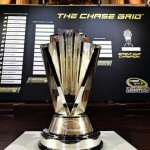 Six teams are in Nascar’s Elite Eight. Talladega was tense with hard and clean racing. A huge name won and made it into the next Chase round. People outside of Nascar continue to talk about the race Monday morning. So how is this a draw? Qualifying was a disaster. A total dumpster fire. This should be so simple. Drive around a track a few times. Whoever is fastest wins the Pole. Whoever is second fastest starts second. Wash, rinse and repeat. Track position is everything in this Chase. For teams to not understand rules of competition for that component of the race ever, and especially during the playoffs, is impossible to fathom in any other sport. The sanctioning body has to do better to clear the air. Nascar moves from speed to short with a trip to Martinsville. Enjoy the week, and insert a random catchphrase here.